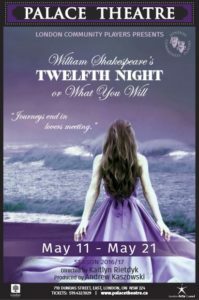 Twelfth Night features all of the hallmarks of a Shakespeare comedy: mistaken identities, clever wordplay, the interplay between nobility, servants, and commoners, breaking the fourth wall, and a raft of others. It’s one of the most-produced plays in London and area—this year alone there’s already been a high school production, and it’s on at Stratford too. So why should you see LCP’s production if you’ve already seen the play? In short, because it’s fantastic. Director Kaitlyn Rietdyk has created a millennia-spanning pan-Balkan musical mashup that essentially one-ups Shakespeare at every turn. She’s integrated a Greek chorus into the play, which is traditionally set on the coast of the Adriatic Sea. She and composer Matthew J. Stewart have taken the songs in Shakespeare’s text and expanded the role of music, using the chorus in its full traditional sense. She’s also borrowed the storm from The Tempest , converting the opening scenes from a lighthearted introduction to a surprisingly effective shipwreck; “If music be the food of love, play on” is no longer an invitation by Duke Orsino but a challenge from Poseidon. The shipwreck also serves to highlight the simplicity of the production. There’s no prerecorded sound: everything the audience hears comes from the people on stage, including Stewart on a small drumkit. The all-female chorus, led by Rachel Flear with some impressive solo vocalizations by Margarita Sanchez Leon, invokes the Illyrian setting using only their voices and movement; the simple drapes provide little more than a surface for lighting changes. The costumes are ideally suited—particularly those of the chorus—and given the number of people credited on the costume sewing team one has to assume they’re all made to order. Rietdyk has assembled an outstanding cast, including long-time collaborator Jennifer Hale as Viola. This is very much a play about women; it’s hardly a surprise, given their company Empty Space Productions and other past work. While the male characters, plus Julia Webb’s Maria, are largely comic relief, they’re essential to the plot and well-performed, and while they flirt with going over the top they’re almost always reined in just short. Feste, the troubadour fool often considered the representative of the chorus in productions that don’t include an actual one, is more than given his due by Lliam Buckley. The best cover versions of songs aren’t simply remakes or tributes; their artists use the original work as a springboard to create something uniquely their own. LCP’s Twelfth Night is a great cover of some seventeenth-century rock and roll. Wow! Thank you for your comment! It made my YEAR!!!! In addition, reviews like this is the best price for us, who do Theatre because we love it!